The ethanol gold rush: How much is fools' gold? Politicians and Midwest farmers have jumped on the bandwagon but, as writer Joseph A. Davis points out, ethanol development involves many nasty trade-offs. And while 4 million cars on American roads can use an ethanol blend already, hardly any gas stations sell it. Why is that? Q: What problems are the government and grain industry trying to solve with ethanol? Fuel shortage? High fuel prices? Dependence on foreign oil? Air pollution? Greenhouse warming? Q: How big is the federal subsidy for ethanol production? How much bigger do Congress and President Bush hope to make it? Q: Will the price of ethanol fuel be lower than the current price of gasoline? Q: Will shifting some of U.S. transportation fuel demand to ethanol from gasoline reduce U.S. emissions of greenhouse gases? Q: Will increasing U.S. use of ethanol, whatever the feedstock, reduce other air pollution from what it would otherwise be from petroleum-based gasoline automobile fuel? Q: Does corn-based ethanol save energy? Does producing it require more energy inputs than the energy yielded by the fuel itself? Where will the energy to produce and refine the ethanol come from and what will be the environmental consequences of producing and using that energy? Q: What are the environmental costs and consequences of a large increase in U.S. corn production? From fuel use? Soil loss? Fertilizers? Pesticides? Loss of conservation acreage? Other factors? Q: Is there a level playing field in the fuel and biofuel markets? Does corn-based ethanol get an advantage over ethanol produced from other feedstocks and processes? Does corn-based ethanol get an advantage over other renewable, alternative, or “green” fuels? How do the subsidies for corn-based ethanol compare to those for petroleum and petroleum-based fuels? Q: Is ethanol fuel, such as the blend known as E85, available in your area? Why not? For Democratic and Republican presidential candidates alike, supporting ethanol in Iowa seems at first as much a no-brainer as eating a corn dog at the county fair. Iowa’s January 14, 2008, caucuses are still the first state event that will choose convention delegates. Iowa also produces more corn than any other state. It is hardly surprising that John McCain and Hillary Clinton are working hard to convince voters in a state where corn is king that they never really opposed ethanol subsidies. Nor is it surprising that Barack Obama, whose home state of Illinois rivals Iowa as top corn producer, often reminds campaign audiences of his long support for ethanol. 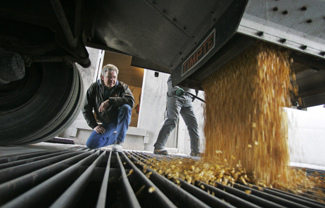 Ethanol is the focus of a new gold rush. Farmers across the Midwest are rushing to plant as many acres of corn as they can – even as the price of corn is skyrocketing. New ethanol refineries are being planned and built near the corn. The extra corn will produce ethanol, a non-fossil fuel that can be burned in car engines. Little of this would happen without hefty federal subsidies, and ethanol is being touted as clean, green, and a key to solving the nation’s energy problems. Ethanol as a fuel is practically as old as the automobile. Serious federal subsidies for corn-based ethanol go back at least to the 1970s, when the U.S. began facing the fact that oil was not endless. It got another boost when EPA mandated a phase-out of lead as an octane-booster in gasoline, and ethanol became one of several alternative ways of adding oxygen to auto fuel. The GOP energy bill of 2005 raised subsidies for corn-based ethanol further, to enthusiastic praise from corn states, who watched the price of corn jump in response to increased demand. The current Democrat-controlled Congress is working hard on its own complex of bills to address energy and climate issues. Just what final form that legislation will take remains uncertain; but a further increase in corn-based ethanol subsidies seems a cinch. Both Congress and President Bush want to set a national goal of increasing ethanol production six-fold within 15 years. Ethanol (grain alcohol) can be made from many things, but corn has been a traditional feedstock because it is rich in fermentable sugar and starch. This has been so at least since early frontier settlers discovered that it was easier to get a gallon of “corn squeezin’s” to a distant market than to transport a wagonload of corn. As the price of oil climbs and U.S. dependence on foreign petroleum sources grows, shifting the U.S. fuel mix toward renewable domestic sources like ethanol seems immediately attractive, especially if it makes farmers happy. In theory at least, a move away from fossil fuels and toward renewables is supposed to help with global warming. Burning fossil fuels unlocks carbon that was “permanently” removed from the atmosphere and puts it back into play in the atmosphere. In theory, the best renewable biofuels take carbon out of the atmosphere in amounts hopefully comparable to what they put back when burned. Whether this is true for corn-based ethanol, however, depends on how you do the calculation. Environmentalists, economists, and others say there is a big downside to subsidized corn-based ethanol. The dead zone at the mouth of the Mississippi River in the Gulf of Mexico is predicted to be larger than ever this year – and some experts say that is because of runoff from increased corn production in the Midwest. Farmers this year have planted corn on many acres they were holding back (also with government subsidies) for soil conservation or wildlife habitat. Producing all that corn puts more fertilizer and pesticides into U.S. waterways. Environmentalists say corn-based ethanol will not save energy, improve air pollution, or reduce greenhouse warming. They say the sudden speculative demand for corn is driving corn prices so high that buying food is painful in poor nations dependent on U.S. food exports. The past year has actually seen price-driven “tortilla riots” (perhaps more accurately described as organized political protests) in Mexico. Getting cars to burn ethanol is not the problem; cars have burned ethanol since Henry Ford built his first car in 1896. In fact, many U.S. car-owners are driving “flex-fuel” vehicles (which burn either gasoline or E85, the 85%-ethanol fuel blend) without even knowing it. Car companies are selling them like hotcakes in ethanol-friendly Brazil, where some two-thirds of new car sales are flex-fuel vehicles. But the ability to burn ethanol is not a selling point in the U.S. market, because there are few places to buy E85. The major reason U.S. automakers are selling them here is a loophole in the law that mandates automotive CAFÉ (mileage) standards that allows companies to sell more gas guzzlers if they build flex-fuel cars. There are an estimated 4 million flex-fuel vehicles on U.S. roads today, many in fleets. From a business perspective, the ethanol price and investment bubble could burst quickly if all that ethanol can not easily get to market. Producers of fuel ethanol are almost entirely dependent on the existing network of gas stations to distribute and deliver their product to the ultimate consumer. Those gas stations (and the gasoline refining and transport network that feeds them) are for the most part controlled by oil companies. Despite the boom in ethanol investment, only a tiny fraction of U.S. gas stations yet sell E85. Some critics, like Mark Cooper, Research Director for the Consumer Federation of America, say oil companies are resisting increased ethanol fuel sales. If reporters don’t ask whether this amounts to restraint of trade, it is unlikely that the government will. Joseph A. Davis has been writing about the environment, energy, and natural resources for 30 years. Correct, Where is the Press? Since this is a forum for discussion of press and its watchdog responsibilities Mr. Davis makes a good point. The press should be writing boldly about the foot dragging by oil in adopting ethanol blends at pumps today. Each day that passes without a move to alternative energy - more American servicemen and women are in jeopardy of harm. For every barrel of oil NOT imported from heavily defended Middle East outposts - our national security increases. Ethanol is first, a national security issue. The environmental impact of a transition to ethanol is far lower than if we were to continue importing oil with all its tangential costs. Corn is only the first feedstock to be used - next is cellulosic stocks: stover, switchgrass, wood, etc. which are non-food biomass sources. Energy crops do not need the fertilizer and pesticides of food crops and should stimulate knowledge of more organic ways to grow both. We need to transition to ethanol even with its marginal downside to lower greenhouse gases and petro pollutants, to become independent of oil, and to expand energy economies. It's good for the country.